If you think about it, planes haven’t been around for that long yet — but they’ve come a long way from the Wright Brothers’ first flight in 1903. When that first plane got off the ground, it was immediately clear that human flight would have a huge impact — but nobody would’ve been able to predict just how much it would change the world. Today, over 200.000 planes take to the skies every day — a number that’s hard to visualize if not for the popular flight tracking website FlightRadar24, which shared an incredible video of the first day with this many flights in June 2018. The continuous increase of travelers around the world have pushed in airlines to step up their game and start offering more to their premium and economy travelers. Let's take a look at what we can expect from a flight in 2020. One of the best things about being in a seat high up in the air is that you can finally catch up on some work. If you are type to complain about the wifi in airplanes, you might need to find something else to complain about. Thanks to aerodynamic mounted antennae and new Ka-band systems that could improve speeds up to 10 times, which would finally creating a place that could double as an office. Boeing’s latest aircraft, the 787 Dreamliner, has already been adopted by a multitude of airlines. 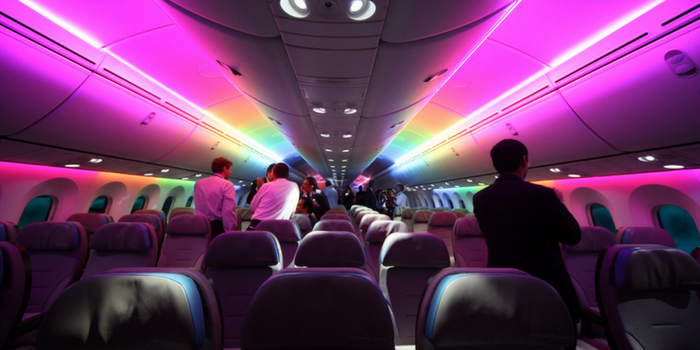 It’s designed to make for a more comfortable, fuel-efficient flight and comes with a large number of improvements, including the use of mood lighting throughout the plane. During the trip, flight attendants can pick and choose between a variety of different settings that enhance the passenger experience, for example by giving off a soft orange glow when the sun is rising outside the aircraft. Taking it to the next step, Boeing has filed a patent for a projection system that could light up the ceiling with real-time visuals of the stars up above. Unfortunately, for low-cost airlines these could probably be changed into ads. How do you like you seat? 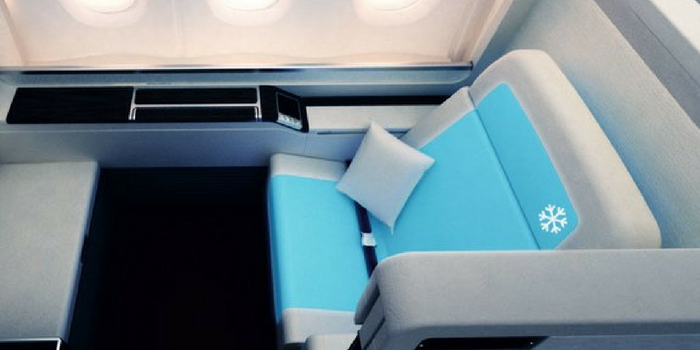 While most airlines seats already have some level of recline, aircraft technology companies like Panasonic and Gentherm have been experimenting with heating and cooling seats. This would make it possible to alleviate the constantly changing temperature in an airplane, instead of constantly having to keep a sweater handy. Again the awards goes to Panasonic for its innovative integrated AC power charging stations. Charge multiple devices with the multiple USB power ports, Bluetooth 4.0 and NFC for a personalized passenger experience. If there’s something that comes at a premium in an airplane, it’s space — simply because getting more people on a plane means more money for the airline. 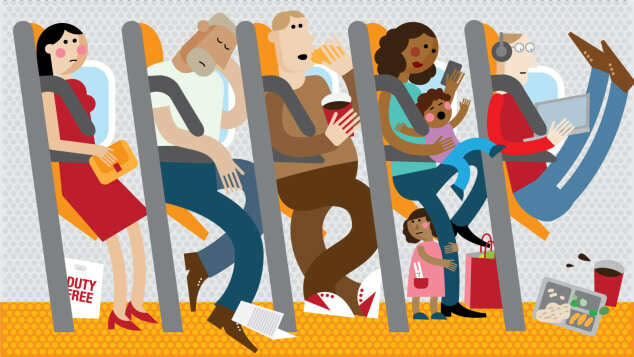 Even though low-costs already skimp on legroom, you might be able to opt for an even cheaper seat soon. According to recently filed patents, French airplane designer Airbus is working on some incredibly uncomfortable-looking seat layouts that could seriously change the way we travel — but it might be better for everyone if they don’t actually come to fruition. Other innovations are a lot more customer-centric, however, like the self-cleaning toilet that’s currently being trialed by Boeing. 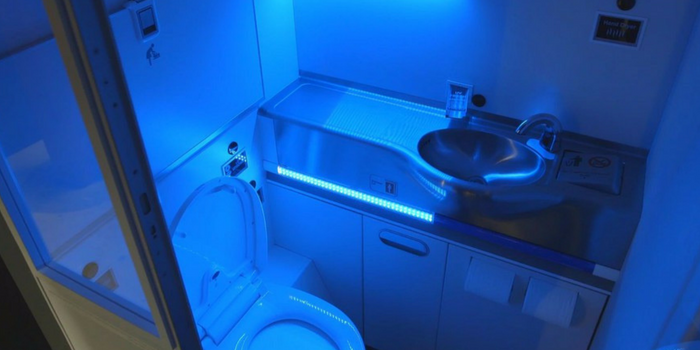 After a couple of hours in the air, the lavatory isn’t the most hygienic place on the plane anymore — and that’s why ultraviolet light can make a real difference. In between uses the cabin would be flooded with this light, killing 99.99 percent of germs in the process. Combined with antibacterial surfaces and touchless controls, these changes will result in a sparkling clean toilet every single time. Even though the Concorde eventually went out of business, people haven’t given up on the dream of building a better and faster plane. A couple of technologies are currently leading the way, including biofuels and electric propulsion — one being a way for planes to get off the ground using liquids like recycled vegetable oil to plant-based ethanol, while the other would not need to burn anything at all. Progress is also being made in terms of getting to your destination faster. 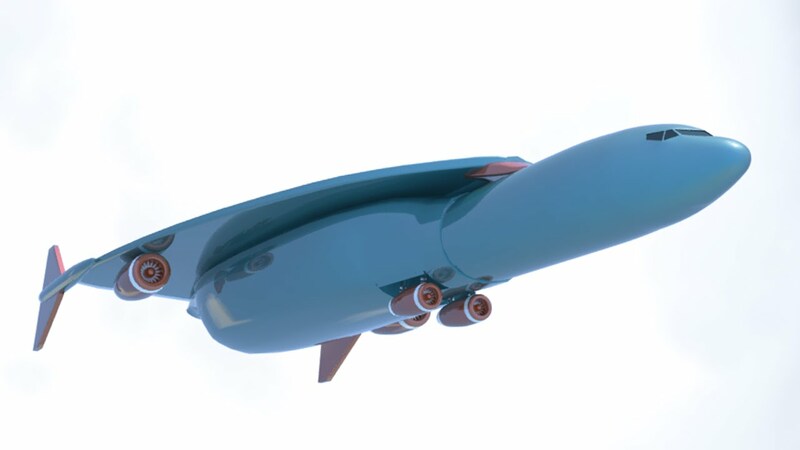 Airbus registered a trademark in 2015 for a hypersonic plane that would be able to reach speeds up to 4.5 times faster than currently possible. While the first hypersonic flight probably isn’t happening in the coming years, it might as well be fully autonomous. Find out the 13 key features which all great expense tools should have including; user friendliness, optical character recognition, industry compliance reporting, localisation, ERP integration, ability to be used anywhere and anytime, pricing and ROI, clear functionality, reporting, experience, great customer service, maintenance roadmap and security. If you’re a CFO, you care about everything your company is spending money on, and you’re always looking for smart ways to cut costs where you can — while still ensuring that your employees get the best tools for their job. It makes total sense to invest in an expense management platform, but it’s worth looking into the differences. In 2011, Marc Andreessen said it first in an essay for the Wall Street Journal — software is eating the world. Eight years down the line, it turns out he was right — almost every technology company is doubling down on their software efforts, and a seemingly limitless amount of software-as-a-service (SaaS) startups are founded and funded every day. 500K+ professionals across 60 countries are using Rydoo.